In September 2015, people around the world were galvanized into action by a photograph of Alan Kurdi, a two-year-old Syrian refugee who drowned off the Turkish coast along with his mother, Rehanna, and his four-year-old brother, Ghalib. In The Boy on the Beach, Alan’s aunt Tima Kurdi tells her family’s story and writes about their efforts to come to Canada. That morning, Abdullah met with the smuggler again. “Can you pay more?” asked the smuggler. “Then you’ll have to settle for a rubber dinghy,” said the smuggler. “I’m not risking another rubber dinghy,” said Abdullah, and he walked away with a heavy heart. He returned to the hotel room and broke the news to his wife, Rehanna. They didn’t know what to do. Time was their enemy. If they stayed even one more night, they might not even have enough money for a dinghy. “Don’t worry. Thank you,” Abdullah said. Abdullah and Rehanna once again prepared for the crossing. Rehanna had a list of our phone numbers—I has asked her to write them all down on a slip of paper and put that piece of paper in something plastic and watertight, just in case. When Abdullah placed the list in his pocket, he found some Turkish coins. What would he need those coins for in Greece? He put them on the dresser. Ghalib noticed and said, “What are you doing, Baba? That’s a lot of money. I want to keep those coins.” Abdullah put the coins back in his pocket with the phone numbers. Rehanna and Abdullah dressed the boys for the journey. Ghalib wore blue shorts and a blue shirt. Alan wore the red T-shirt and long blue jean shorts that I had purchased for him in Turkey. Both boys lay down for a nap and were soon fast asleep. The sun set and the sky turned dark. It was a warm night. Ghalib woke up hungry. They were feeling stir-crazy after so many nights of doing the same thing, so they decided to get something to eat, then go to a park near the rendezvous point and wait for the smuggler’s call. Abdullah put Alan’s shoes on, securing the Velcro straps and then kissing them, over and over. “Alan was still half-asleep, but he smiled,” said Abdullah recently. “Stop it or you’ll wake him up,” Rehanna told Abdullah. Abdullah and Rehanna were anxious. They didn’t want any surprises, so Abdullah called the smuggler and demanded to see the boat in advance. The smuggler agreed. He met Abdullah near the park, and they drove for more than an hour, heading west and around the point at Akyarlar, then north along a road that hugged the shore. That area was very busy with tourists and hotels and lively restaurants and bars. They passed a few strips of beach and finally arrived at a spot near a marina. Abdullah promised that the boys would be quiet. Then he handed over his fee. “Be ready for my call,” said the smuggler, as he dropped Abdullah off near the park. “I paid the money. We are leaving in an hour or so,” Abdullah said to Rehanna when they met back at the park. “Tawakkalna ala Allah. Trust in Allah’s plan. We need to finish this,” Rehanna said. Alan was still sleeping, but Ghalib was awake. The temperature was perfect—twenty-one degrees—the humidity was low, and the wind was light. When the sky turned dark, it was filled with stars, and the moon was only starting to wane. I imagine Rehanna pointing up to the sky and marvelling at that moon and those stars with her typical optimism. But I’ve never had the heart to ask Abdullah if what I see in my mind is accurate. The smuggler’s call came a little after midnight. Abdullah and Rehanna carried their sleeping boys to the rendezvous point nearby. Soon after, a car pulled up. Aside from the smuggler, there were two male refugees in the front seat and a woman and young girl in the back. Abdullah and Rehanna got into the back with the boys in their laps. During the hour-long drive, Alan and Ghalib were fast asleep. The touristy areas were quieter, but the bars and streets around the marina were still quite busy. As they got out of the car and the smuggler guided the group toward the boat, another family appeared—a husband, wife, and three children. It now seemed that there were too many people for the boat. Abdullah and Rehanna didn’t know what to do. Financially, could they afford to hold out for another fibreglass boat or even another rubber dinghy, even for a few more days? Could they afford to give up on Europe and return to Istanbul? The kids were already so skinny and sickly: Would they survive another winter? There was already a hint of autumn cool in that late summer wind. Abdullah couldn’t have known that the choice he was about to make would change his life and also change the world. From the time I received Abdullah’s first text from Izmir to the time I got his final text on the night of August 31, I called Baba every night. “Rabbi yassir wa la tu’assir. Oh God, please ease their troubles,” he would say. I waited for Abdullah’s texts, or any news from my family, anything to indicate that they were still alive. In those many hours between texts and conversations, my mind raced back and forth, from the sunny spots to its darkest corners, thinking the worst, hoping for the best, searching for clues that I might have missed within our chain of text messages, monitoring any news I could find, watching the video Abdullah had sent of the waves. Our whole family was praying for them to cross safely. Since early August, I had been living in two worlds. In one world, I was a wife and mother and hairdresser living a lovely life in Vancouver. 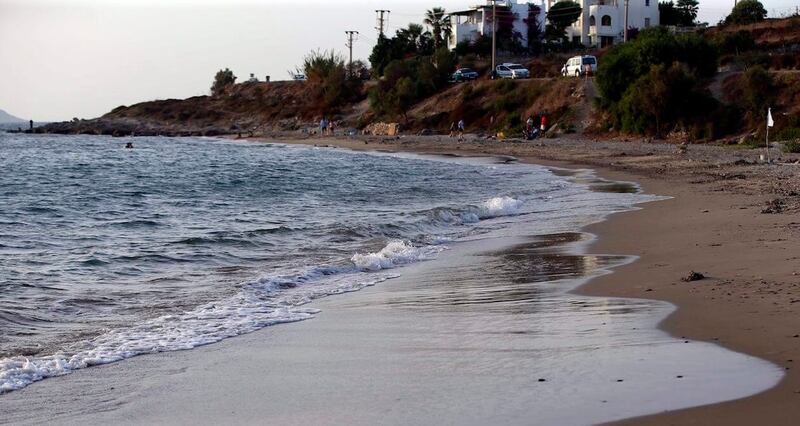 In the other world, I was helping my family, desperate Syrian refugees who had given up hope of a sustainable life in Istanbul and had turned their sights on Kos. These two worlds were separated by 10,000 kilometres and eight time zones. If you had asked my husband and my son which of those worlds I spent the most time in, they would have said the latter. On August 28, I read the horrifying news that a refrigerator truck was found in Austria containing the bodies of seventy-one refugees, four of them children. In Macedonia, Bulgaria, and Hungary, the governments had chosen to deal with the surge of refugees by building higher fences to keep them out. But none of these stories seemed to grab the public’s attention. Perhaps the news was too terrible and depressing to imagine, so people who did hear about it simply blocked it out. I can’t blame them. I used to be like that once too. On September 1, I woke up long before the sun rose. I sent Abdullah many messages, nagging him to text me back. I was glued to my cellphone all day, checking it compulsively. From The Boy on the Beach by Tima Kurdi. Excerpted by permission of Simon and Schuster Canada. This excerpt may not be reproduced or reprinted without permission from the publisher. How do you explain proselytizers to a friendly newcomer?